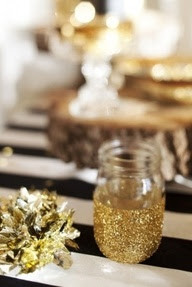 With the Spring holidays coming early this year, we wanted to create a post with some ideas for you to incorporate into your festivities. We just recently made three different egg dishes that would be a great addition to an Easter brunch or Passover luncheon (as the egg is a symbol for both of these holidays). We thought this would be a great way to start off the season and show off some delicious recipes we found along the way. Thank you Pinterest! Spinach Egg Cups: We made this recipe with mushrooms and shredded mozzarella cheese for one of our Craft Club meetings. It was a nice addition to the other brunch items the girls brought. Mini Broccoli and Cheddar Quiches: We simplified this recipe by using already made mini phyllo dough cups, which we baked in a mini muffin tin. If you follow this recipe, but want to take the easy route (like us) you can cut out the entire second step. 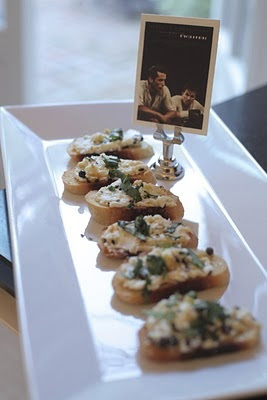 This appetizer was also created for one of our recent Craft Club events. Shrimp and Asparagus Frittata: This recipe was delicious! Lauren followed the directions closely, only substituting reduced fat feta for the goat cheese as she had it on hand. She served it to her husband on Valentine’s Day over a bed of arugula topped with a little balsamic vinaigrette dressing and enjoyed every bite. We hope this Spring brings warmer weather, time with friends and family, and some great opportunities to try these recipes out while entertaining in your homes. With the Academy Awards just around the corner, we wanted to create a post full of inspiration and ideas for an event in its honor. While looking for a place to start, we turned to our fashion expert, Darci Gwartz for advice. Darci informed us that black and white is all the rage right now and that we probably will see a lot of it on the Red Carpet this year. We decided that you cannot go wrong with such a classic look and built our whole concept around this color scheme. The most obvious example of classic black and white is the tuxedo. Although there are many ways to make them more interesting, they look best when kept simple. Women, on the other hand, are encouraged to change up their look often and search outside the box to impress their peers. A long white gown is most commonly associated with weddings, but we love that Red Carpet events have given women the opportunity to wear this fashion statement in such a glamorous way. 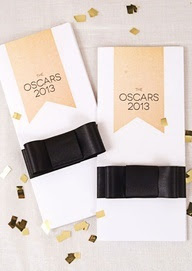 We took this concept and turned it into a formal event which could be thrown at home for the Oscars. As the color scheme is understated we wanted to use patterns, textures, and interesting details to tie the whole thing together and create an event to remember. Filling the ceiling with balloons creates a festive atmosphere while keeping the main focus on the guests’ formal or cocktail attire. Small touches such as these gold glitter votive candle holders, striped tablecloths, and small flower arrangements in the signature colors complete the look. 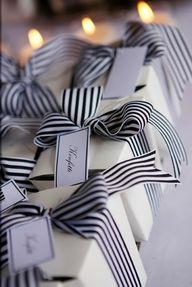 Guests are sent a formal invitation which sets the mood and asks each person to attend dressed to impress (in black and white, of course). Even the smallest of details are important. 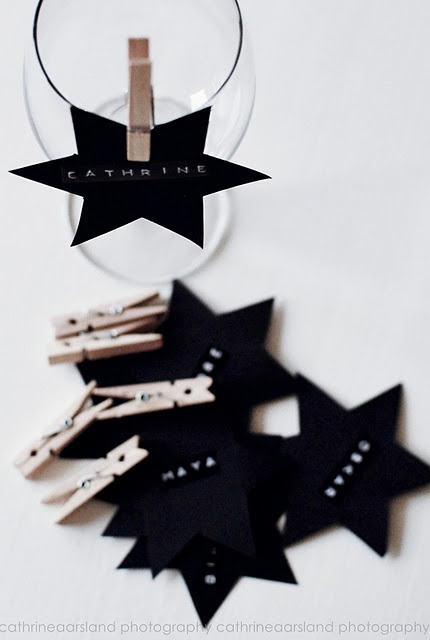 These star-shaped name tags are appropriate for the Oscar theme and make it easy to find your drink. A party is more fun with some friendly competition incorporated. A survey is filled out upon guests’ arrival adding an extra element of excitement in hearing the night’s results (especially when a prize is attached). 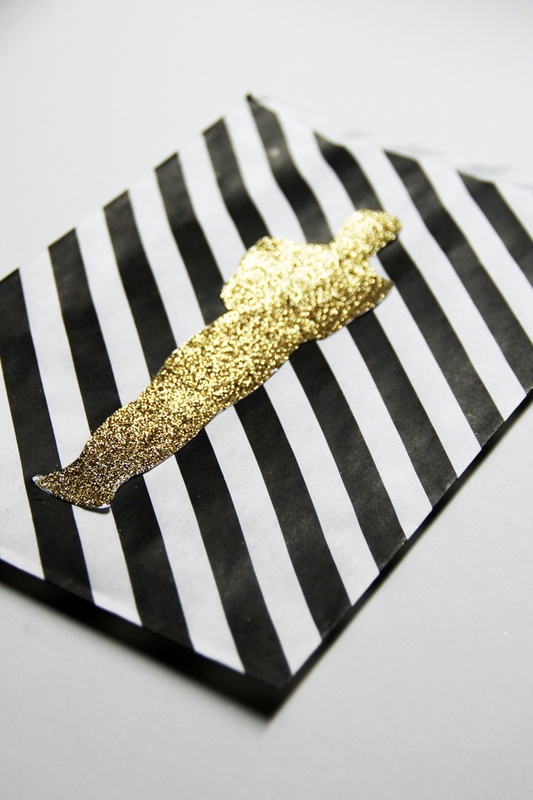 We love this favor bag and gift wrap, whether filled with a fun souvenir for each guest to remember the night or a special prize for the winners of the contest. You may even want to fill these adorable bags with popcorn. 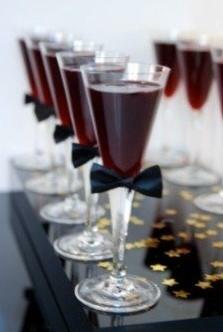 This signature cocktail is made festive for the evening complete with bow ties on each glass. Finger foods are definitely the way to go for this type of event. You could have nice tables set up with trays of appetizers complete with fun snacks like ones you would find at the movies. You may even hire servers to walk around and offer these items as you watch the awards. We love the small details, once again, including the movie signs on each appetizer tray and the fun wrapping making even popcorn look glamorous. We hope you have enjoyed this inspiration post. We know we had a great time preparing it. 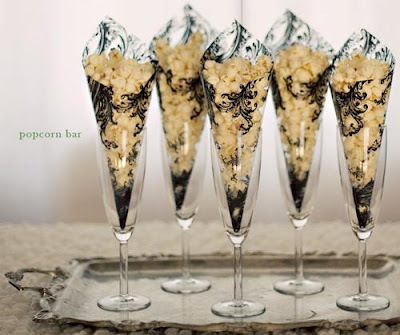 We think a lot of these great details can be incorporated into your own Oscar party and would love to hear how you use them. Keep us in mind when planning your next event. 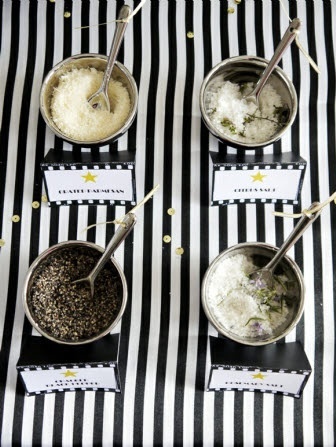 We would love to work with you Side by Side to create a special party for you and your guests. When we think about celebrating Valentine’s Day, treats are always involved. We can remember back to when we were in elementary school. This holiday was filled with treats; classroom parties with pink cupcakes and heart shaped cookies and exchanging Valentine’s stuffed with Conversation Hearts. Our parents knowing they would pick us up all hyped up on sugar. As a teacher, Tami has continued this tradition, which makes Valentine’s Day the perfect excuse to have a school bake sale. At least if the kids are going to be on a full-day sugar high, we can fund raise for field trips at the same time. 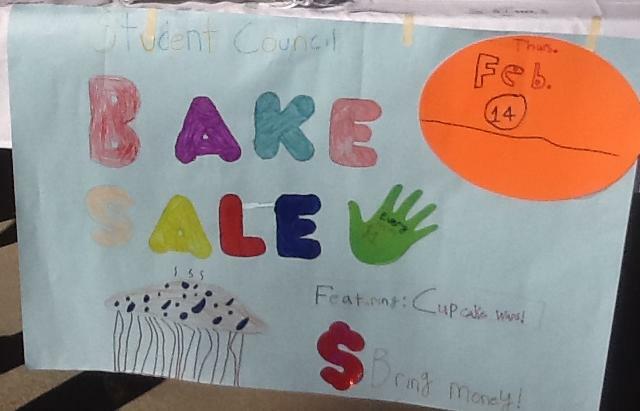 As part of getting people involved in this event, the school’s Student Council had a brilliant idea. They invited all students to participate in a cupcake contest with a prize (of course). One of each of the batches of cupcakes that were entered in the contest were set aside for the Student Council members to judge. The cupcakes came in a variety of flavors and themes including; Angry Birds, “Sprinkles Cupcakes” knock-offs, and Candy Land inspired cupcakes covered in sweets. The winners were chosen based on taste and look. A second grader won the contest. She created a cupcake version of her own family tree complete with potato chip and pretzel hair and jelly bean eyes. As her class has been studying family trees in Social Studies, this was a perfect way to reinforce her learning at home. As the contest was for students only, Tami was not able to enter. She, of course, did not want to go up against her students anyways, but did want to contribute to such a good cause. We created these adorable cupcake cones to donate to the bake sale and the students loved them! What could be bad about a cupcake in a cone that looks like a real ice cream sundae? We even dyed the cupcake batter with green food coloring and added mint flavor and mini chocolate chips to make it more authentic. We also added white frosting as the whipped cream, chocolate sauce, and a maraschino cherry. This mini ice cream sundae is not ice cream at all. We made a small cake out of the leftover batter to have for dessert that night, as we did not want to miss out on this special treat. We feel strongly that the concept of a cupcake contest and bake sale is a great way to get more people involved for a good cause, and we are so glad we were able to participate. This Sunday, our Great Grandma Mary is turning 105. No, that is not a typo. Grandma Mary was born in England in 1908. She and her mother followed her father to America through Ellis Island where Grandma Mary continued to go to school and eventually met her love (Great Grandpa Abe). For many years, we were unaware of how truly lucky we are to have grown up knowing our great grandmother. We always figured this was normal. However, we were soon to find out that this is simply not the case, and to know someone who will be celebrating 105 years is about as rare as they come. So, for the past two years (right before Grandma Mary’s birthday) we have made a point of visiting her to conduct a small informal interview. When we arrived at Grandma Mary’s apartment last weekend, we were welcomed by the many photographs she has all over of her children, grandchildren, and great grandchildren. She takes great pride in announcing that her family, that means so much to her, has grown quite large, and Lauren feels proud to be adding to that by giving her her first great great grandchild. Grandma Mary was also quick to tell us that her birthday was coming up (as if we didn’t already know) and that the Beverly Hills Police Department would be throwing a party at the park in honor of the service she had contributed in the past to her community. We, however, had another agenda in our visit with Grandma Mary. We wanted to track down her “famous” lemon cake recipe. 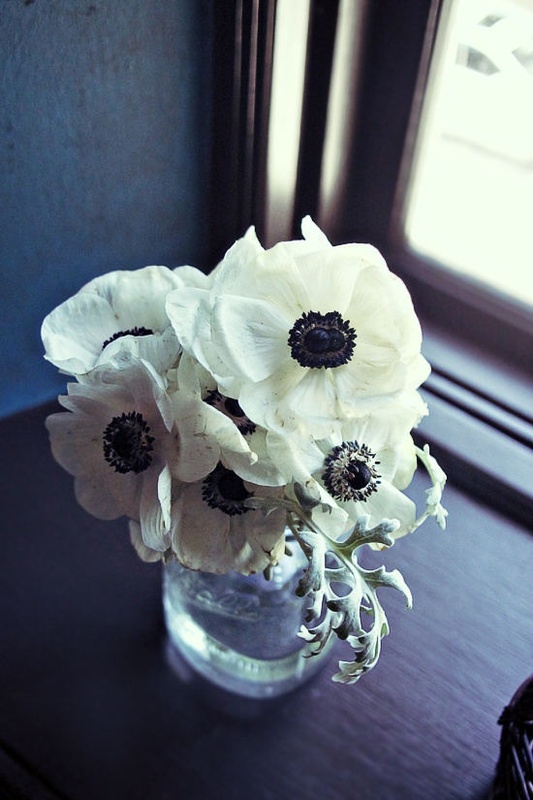 She told us that she used to make it for everybody, and even used to bring one every week to the beauty shop. We were beyond impressed when she thumbed through her recipe box to find what we had asked for and read the recipe to us without any need for glasses. She then gave us a slice from a cake a woman at the beauty salon had made for her to return the favor. Grandma Mary’s lemon cake is one of the things we will always remember her for, along with her chocolate chip cookies (seen on our previous post: 104 Chocolate Chip Cookies), chopped liver, and the slippers and blankets she used to make to warm us up. When we asked her how she did all of these things, she simply replied, “What I didn’t do, God!”. We have created our own slightly different version of Grandma Mary’s lemon cake to bring with us to celebrate her birthday on Sunday and hope that it will brighten her day. Here’s to 105 years, Grandma Mary, we wish you the best in health and happiness in the year to come!